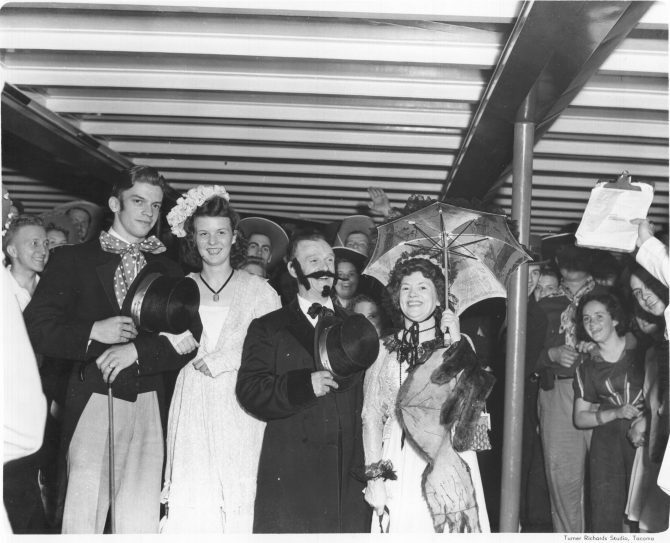 Passengers on board the streamlined Kalakala on July 2, 1940, for the last ferry ride across the Narrows due to the opening of the (first) Tacoma Narrows Bridge. Several passengers have dressed in early 20th century costumes to celebrate the occasion. The voyage on the Kalakala was sponsored by the Young Men's Business Club who asked the 1440 revelers to wear garments of olden times. Fifteen floor prizes were awarded in various dance contests.